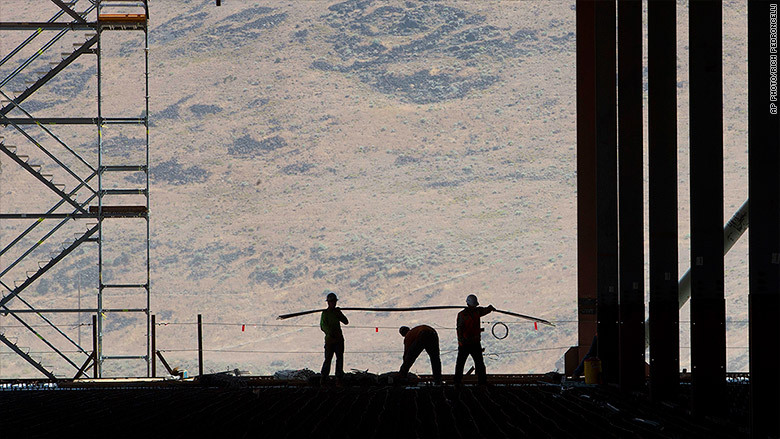 Out in the desert, just off Electric Avenue east of Sparks, Nevada, over 1,000 workers are building what will be the largest building in the world in terms of its footprint over the ground. 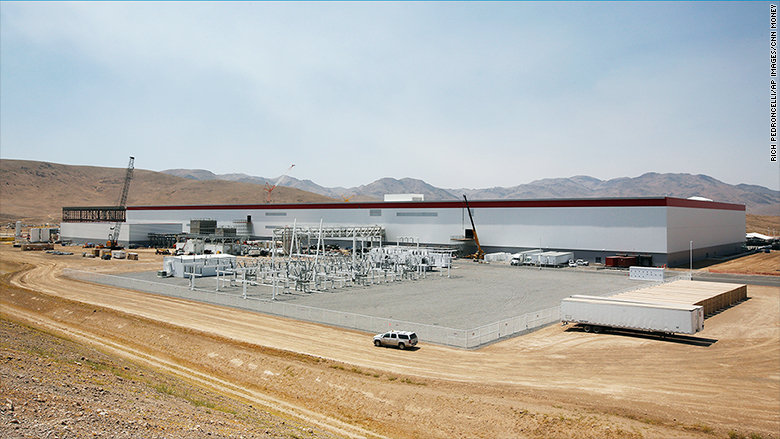 This is the Gigafactory, where Tesla plans to build enough lithium ion batteries to catapult Tesla's electric vehicles into the mainstream. It will be about 5.8 million square feet when completed around 2020. Tesla believes that the adoption of electric vehicles has been hampered by the high cost of lithium batteries, so it plans to use this factory to drastically boost production. The factory currently has almost 2 million square feet of space on several floors -- and the structure is only 14% complete. "I think the Gigafactory has to be the most exciting factory in the world," Musk said of the project. By 2020, Tesla (TSLA) hopes to be producing more batteries at this one factory than were produced in the entire world in 2014. With that flood of batteries, Tesla says it can drive down their cost by over 30%. 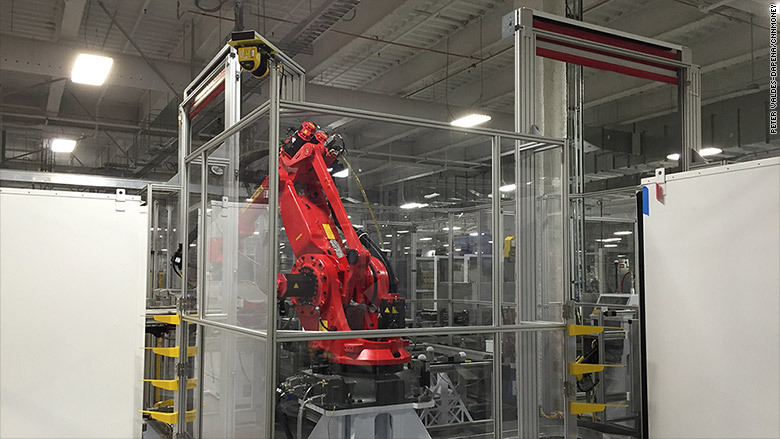 For now, Tesla is only assembling battery packs for its home and industrial energy storage products at this factory. The batteries themselves are not being made here yet. Workers are assembling batteries made in Japan into battery packs that then go into Tesla's Powerwall and Powerpack products. By the end of this year Tesla plans to have its battery partner, Panasonic, making the actual battery cells here. Panasonic and Tesla will each operate parts of the facility which will exist as a single huge building. Panasonic will make battery cells, and Tesla will assemble those cells into battery packs. It's Tesla's building, though. Tesla is even building it itself rather than hiring an outside contractor. The plant is strategically located about five hours from Tesla's Fremont, California, factory. That's where the car batteries will be fitted into Tesla's new Model 3 sedans. The lower cost batteries produced here will be crucial for keeping the Model 3's price down to a relatively affordable $35,000 base price. 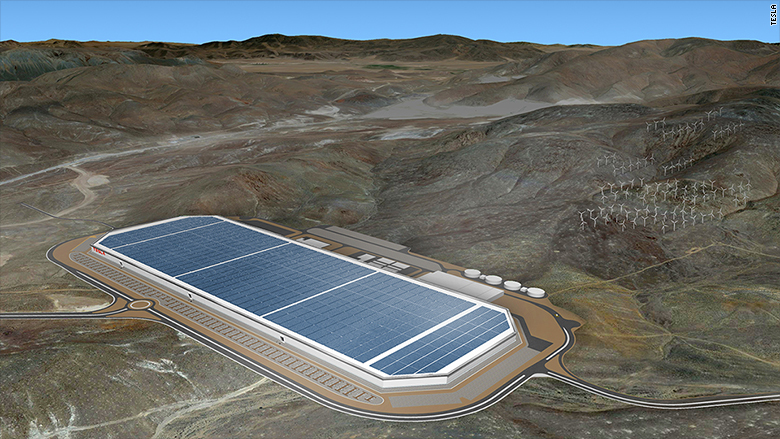 By 2018, Tesla hopes to make enough battery packs here to build 500,000 of the cars each year. The original plan had been to reach that goal by 2020 but Tesla pulled that goal forward by two years speeding up construction on parts of the factory and bringing and installing equipment earlier. By 2020, Tesla now expects to be producing enough of the packs each year to support 1.5 million cars per year. A large part of the battery production will go, not into cars, but into so-called stationary power storage, a business that Musk expects to grow even faster than the electric vehicle business. Inside, the Gigafactory building is braced throughout with huge red reinforced Xs of strong earthquake resistant bracing. 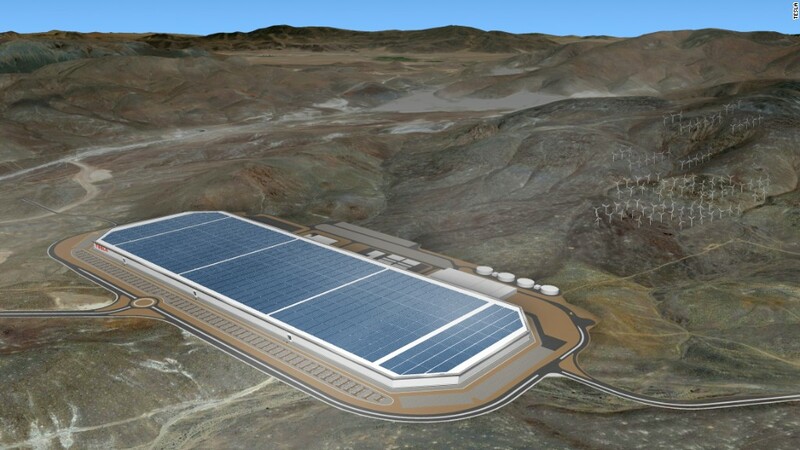 Despite the fact that it will be one contiguous lozenge-shaped building, the Gigafactory is being built as series of separate structures as further protection against catastrophic earthquake damage. Although the building is a full four stories tall there are, in some places, only two or three actual floors -- which allows room for tall machines, some of them dozens of feet high. Musk said he can get emotional thinking about this giant battery factory. "I think it's quite romantic, actually," he said. When finished it will be shaped almost like a diamond with one end pointed toward true north. Also, it's nestled in a valley through which thousands of wild horses roam in the desert heat.